Development meetings held to construct a motion picture centering on '50s game show scandals (tackled by Robert Redford a decade later in the aptly titled Quiz Show) quickly morphed into one of cinema's most quintessentially definitive portraits of '80s excess once Oliver Stone and co-writer Stanley Weiser ditched television to shift their energies towards financial corruption in Wall Street. Needless to say and regardless of whatever target he set his sights upon – for his high profile follow-up to the Oscar winning Vietnam masterpiece Platoon – Oliver Stone was determined to explore greed on American soil. Yet just like his fascination with Vietnam has led him to analyze it from all sides throughout the impressive span of his career, the complex blend of ambition, hubris, greed, excess, corruption and especially abuses of power have served Oliver Stone well as his unparalleled muse for several decades. In fact, to best appreciate Stone is to view the one-two punch of his back-to-back '80s successes Platoon and Wall Street which both encapsulate and likewise foreshadow the moral tests of manhood that Stone continually returns to again and again whether he's introducing us to American presidents, football coaches, or blue collar workers. Although they take place in different decades and different countries, the two films share not just the same star – Charlie Sheen – but also a similar thematic link of dueling father figures that represent two very different paths that you can simplify as good and evil. And in Wall Street, which is incidentally dedicated to Stone's stockbroker father, Stone makes the aforementioned metaphor much more literal. 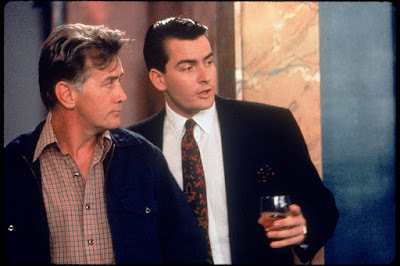 Taking the father angle in a stronger direction, Stone casts Sheen's real life dad Martin Sheen (who starred in the previous decade's definitive 'Nam movie, Apocalypse Now) as the onscreen hard-working honest father of Charlie Sheen's in-over-his-head stockbroker Bud Fox who's being led astray by his hero turned amoral money lust father figure Gordon Gekko (Michael Douglas). After the ambitious, fast-talking Bud foolishly reveals some insider information about the airline for which his father works in the hopes of both impressing Gordon and jump-starting his career as a young broker stuck cold-calling major Wall Street money men with lukewarm financial tips, Gordon pounces on the opportunity to manipulate the younger man under the guise of taking him under his wing. Encouraging Bud to track down information direct from the source even if it means spying on companies from the inside, once Bud gets a taste of penthouse life complete with a trophy girlfriend (a miscast Daryl Hannah), predictably his ethics fly right out the limousine window as he becomes increasingly seduced by the now infamous “greed is good” mantra of Gordon Gekko. That particular line delivered in the midst of an iconic character defining speech by Michael Douglas which helped cement his new status as the amoral “Prince of Darkness” he would become onscreen is the very essence of Stone filmmaking. To be frank, subtlety was never one of the director's strongest suits. And while he would eventually grow a reputation for hitting you over the head with the points he was trying to make by either layering literal dialogue over visceral full-on assault camera work or inserting montages that further illustrated his arguments, in the case of what could've been an endlessly talky “always be closing” David Mamet style treatise on the subject, Stone's approach worked incredibly well for Wall Street. Since most of the make or break it moments for Bud Fox occur on the telephone when we see his elaborate gambles involving multiple players pay off or fall apart, Stone's knack for ensuring that we view the moral dilemma of Bud Fox in broader strokes helps make the admittedly complicated world of stocks, shares and bond trading seem much more accessible to viewers less versed in ticker tape and more fascinated by character arcs. Essentially it's a tale of good and evil with enough gray thrown into the mix so that nothing is too simplistically and therefore falsely black and white even to the point that we're able to look past a slightly protracted, convenient ending for Bud because Stone makes the future of the traders vague and uncertain. Therefore, it's no wonder that classic literary works like The Great Gatsby, Crime and Punishment and writers like Sinclair Lewis, Upton Sinclair, Victor Hugo, and Paddy Chayefsky were at the forefront of Stone's mind going in. 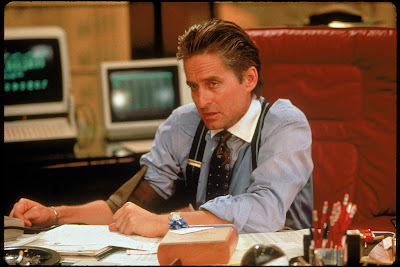 While Warren Beatty and Richard Gere were initially considered for Gekko but both passed on the role, Wall Street is dominated by Douglas's tour-de-force portrayal. 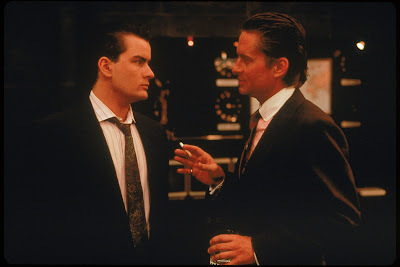 Proving his range in films other than the ones that pitted him opposite Kathleen Turner as a romantic leading man, Douglas's unparalleled strength as Gekko unfortunately augments the weaknesses in other supporting players including both Daryl Hannah and Sean Young which served as an early warning Stone still struggles with today in never being able to craft a truly authentic, multi-layered female character. 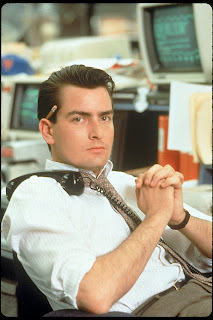 Admittedly, as a quintessentially '80s work which was a period piece even upon release – taking place two years before it was filmed -- Wall Street is slightly dated. 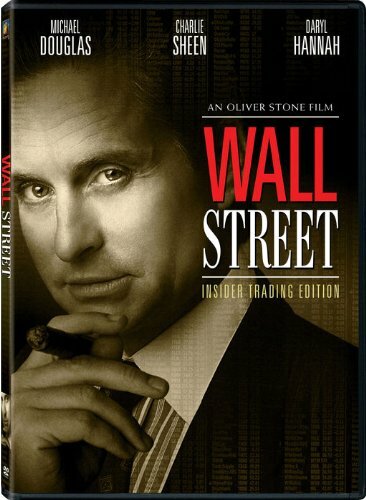 Yet nonetheless the Oscar winning film which has been re-released on a 2-Disc DVD complete with pop-up facts and trivia running throughout in order to tie in with the premiere of Stone's Wall Street sequel arriving in theatres soon, still remains one of Stone's most dynamic works.